Plans for up to 400 new homes close to a National Trust property have been overturned after a residents' campaign group challenged the decision. 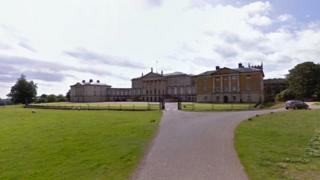 A High Court judge ruled that a government planning inspector got it wrong by opening the way for housing near Kedleston Hall in Derbyshire. Mrs Justice Lang said the inspector had "made an error of law". The Kedleston Voice campaign group has vowed to continue fighting any future appeal or planning application. Catesby Estates Limited, the developer behind the planning application, said it was considering taking further legal advice following the decision. Image caption Kedleston Voice says its mission is to "stop the erosion of the Kedleston Estate and its green bio-diverse parkland"
Peter Steer from Kedleston Voice said: "It is the triumph of the small man or the man in the street over the big developer with loads of money and time on his hands to push forward his concepts of development." He said Kedleston Voice will have to challenge any appeal made by the Secretary of State or a subsequent planning inquiry should the developer still continue with its application. The court heard Historic England, the National Trust and the Gardens Trust had all objected to the development. The developer had applied to build the homes on agricultural land off Kedleston Road and Memorial Road, which is 1.7 miles from the hall. The application was rejected by Amber Valley Borough Council in July 2015, despite a need for housing in the area. Catesby Estates then appealed, and government planning inspector John Gray granted outline consent in August 2016 following a public inquiry. He said the development would not be visible from the hall and therefore did not form part of its setting. However, Mrs Justice Lang said the inspector had failed to focus on the "historic, social and economic connections" between the hall and the development site. Image caption Kedleston Voice also aims to "stop pressure being exerted to our already heavy populated amenities"